High Cascade Snowboard Camp of Mount Hood, Oregon, came to Mountain Creek, in Vernon, NJ for 2 weekends in late winter 2013. Coaches and snowboarders, kids and adults upped their game in the dedicated private snowboard terrain park at South Peak. Jumps, boxes and rails as well as flatland tricks like the tripod and butters were the curriculum and everyone progressed, to their delight. In this video we follow the 3 adult snowboard campers, Mark Scofield, Ralph Rosado, and Mark Bellncula, with their coach (and Burton rep) "Matty B" Bothfeld. Adults were offered separate entertainment from the kids, including BBQ dinner at the Kink, after-camp get-together at Schuss in the Red Tail Lodge and access to the breathtaking Spa at Minerals Resort. Mountain Creek January 2012. Snowboard Lessons, Ski Lessons it's a whole new mountain at Mountain Creek with the beautiful new Red Tail Lodge, The Market cafeteria, outdoors at The Biergarten, Schuss on the mezz, and fine dining in the slopeside Hawk's Nest Restaurant. Lessons are in the new Burton Experience Snowboarding Progression Center. In this video Lauren Traub Teton from SnowboardSecrets.TV takes you from the parking lot to the slopes and shows you what to expect if it's your first time taking a lesson or just your first time at the "new Mountain Creek." Snowboard Instructor Jim Freiband tells us the process and about the unbelievable $30 deal for the 2nd and 3rd lesson with rental and lift ticket. 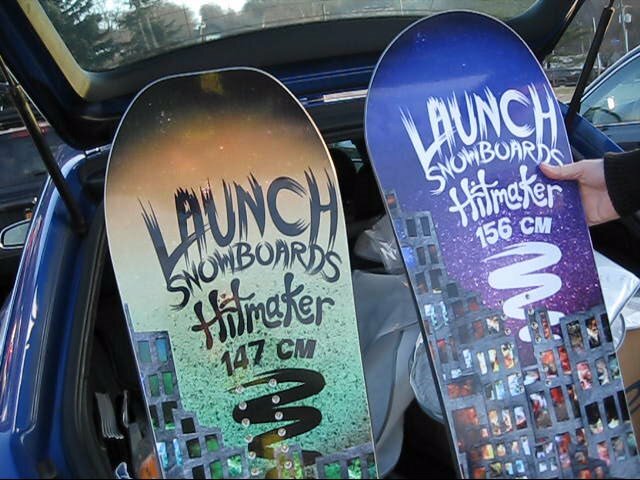 Jon Callahan, CEO of Launch Snowboards gives us a sneak peek of the Launch 2013 Snowboards in the parking lot of Mountain Creek South Base during the 3rd Rail Jam. We meet the Launch lady Vice, camber, and no camber, retail price $399 and the Launch Hitmaker RC - Reverse Camber and regular camber. Video by Lauren Traub Teton for RealPeopleMarketing.com. 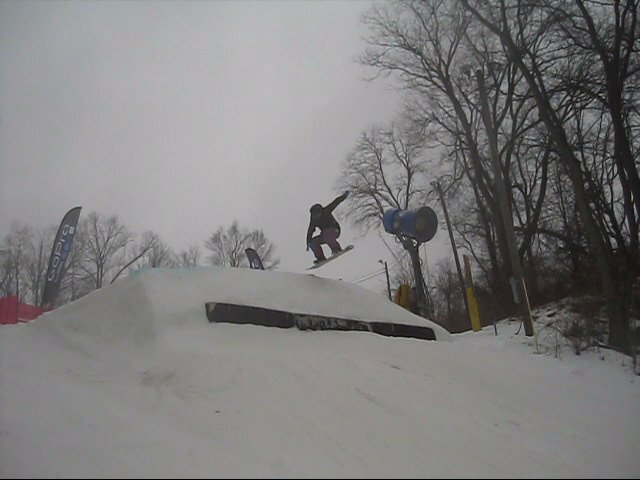 Mountain Creek, Vernon, New Jersey has 2 BagJump inflatable landing pads, added in the 2011-2012 season. See the red one here, for intermediate snowboarders and skiers to practice tricks and jumps, at the Vernon Main Base. The blue BagJump will be set up with a bigger jump at the South Base. Nate Galli, BagJump Manager at Mountain Creek shares a few words with us about the exciting new features. Outside Mountain Creek's South Base we meet our fan, Connor, who shows us his favorite stickers on his snowboard, and they are from www.SnowboardSecrets.TV! Meanwhile we continuously try to thwart one of the crew from placing stickers in unauthorized locations. Video by Lauren Traub Teton, exclusive for www.SnowboardSecrets.TV. Lauren finds her hot yellow green plaid Romy Snowboard Jacket by Turbine Boardwear, for sale at the Monkey Tails Shop in the Red Tail Lodge at Mountain Creek, Vernon, New Jersey. Our friends share their enthusiasm for snowboarding, SnowboardSecrets.TV, and life at Mountain Creek. 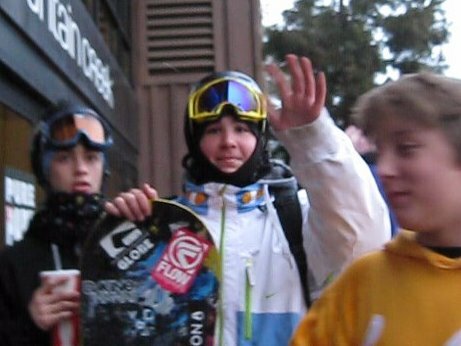 Feb. 2012 Video by Lauren Traub Teton, exclusive for www.SnowboardSecrets.TV. Please Subscribe! Open Class Rail Action and Awards Ceremony at Mountain Creek, NJ's Under Armour 3rd Rail Jam 2012. Tom Weiss takes it again for the 3rd year!! See our video of Sam Zahner and His Boyz here too. Shot with my new Canon SX230 still camera with the 14x optical zoom and video capability! Mountain Creek - Vernon, NJ January 7, 2012. After the 3rd Rail Jam Competition was over we met Kristof and Scotty and Shane, and later Sam Zahner who took the win in the Ski Division. Hear about "The Valley of Death." It was very scary! Send me the name of the young man in the blue jacket! Video by Lauren Traub Teton exclusive for SnowboardSecrets.TV and shout out to the Tech Crew at the Stamford Apple Store who helped me use IMovie for the first time ever and held my hand while I made the video right there in the store. Apple Care, I couldn't have done it without you! So if you notice there's a lot of new bells and whistles in this one, that's why. Noel "Outta Kontrol" Korman of Mount Everest gives us the intro while we sneek peaks at Thirty Two's "Ammo" Snowboard Film Premiere behind him. Scott Stevens rules (!) in" Ammo!" In "Defenders of Awesome" we see clips of Cale Zima, Burnzy Spritz aka Andrew Burns, Mike Rav from Shrewsbury, MA, and Dusten Craven. After the movie lots of swag is tossed, Lauren wins a Mountain Creek lift ticket for being the oldest person there (paying attention), cases of Monster Energy are given out, and then we call it a night early and get this video posted before bedtime!